Jet streams are fast flowing, narrow, meandering air currents in the atmospheres of some planets, including Earth. On Earth, the main jet streams are located near the altitude of the tropopause and are westerly winds (flowing west to east). Their paths typically have a meandering shape. Jet streams may start, stop, split into two or more parts, combine into one stream, or flow in various directions including opposite to the direction of the remainder of the jet. Meteorologists use the location of some of the jet streams as an aid in weather forecasting. The main commercial relevance of the jet streams is in air travel, as flight time can be dramatically affected by either flying with the flow or against, which results in significant fuel and time cost savings for airlines. Often, the airlines work to fly 'with' the jet stream for this reason. Dynamic North Atlantic Tracks are one example of how airlines and air traffic control work together to accommodate the jet stream and winds aloft that results in the maximum benefit for airlines and other users. Clear-air turbulence, a potential hazard to aircraft passenger safety, is often found in a jet stream's vicinity, but it does not create a substantial alteration on flight times. These are narrow belts. Even though the wind "tries" to flow from high pressure to low pressure, the turning of the Earth causes the air flow to turn to the right (in the Northern Hemisphere), so the jet stream flows around the air masses, rather than directly from one to the other. Jet streams are fast flowing, narrow, meandering air currents in the atmospheres of some planets, including Earth. On Earth, the main jet streams are located near the altitude of the tropopause and are westerly winds (flowing west to east). 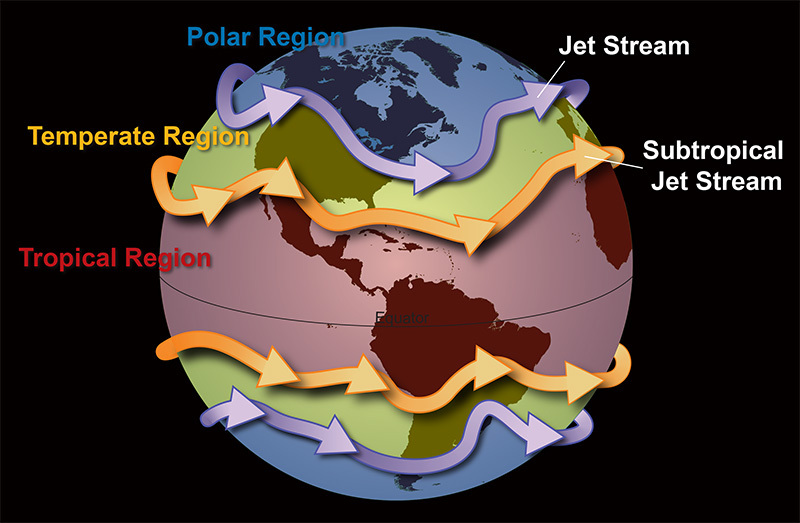 The two jet streams that directly affect our weather in the continental US are the polar jet and the subtropical jet. They are responsible for transporting the weather systems that affect us. The polar front is the boundary between the cold North Pole air and the warm equatorial air. The greater the difference in air temperature, the faster the jet stream, which can reach speeds of up to 402 km/hr or greater, but average about 177 km/hr. Both the Northern and Southern hemispheres have jet streams, although the jet streams in the north are more forceful. + WHO DISCOVERED THE JET STREAM? Jet streams were first discovered in the 1920s by a Japanese meteorologist named Wasaburo Ooishi. He used weather balloons to track upper level winds high above Mount Fuji. The term “jet stream" wasn't used until 1939, though, when a German meteorologist first used the term in a research paper. When a plane flies through this it bounces around. And since jet streams snake all over the sky, a plane can fly in an out of the turbulence many times in a single trip. To avoid turbulence pilots will fly to higher or lower altitudes to get beneath or above the jet stream.